The National Fire Protection Association reports that roughly 30 highway vehicle fires occur every hour in the United States. Approximately 13% of civilian deaths caused by fire are related to a highway vehicle. Hundreds of thousands of car fires occur every year, claiming hundreds of lives and costing an untold amount of damage. Having a fire extinguisher in your vehicle can help you combat a vehicle fire should it occur. There are several reasons that having a fire extinguisher in your vehicle can help you if a fire occurs. Avoid severe accidents caused by small fires. Most car fires start small, and are generally caused by electrical or mechanical problems. If you pull over quickly and use your fire extinguisher right away, you can avoid a much more serious and potentially deadly accident.Other people in your car can also use the extinguisher to put out a small fire much quicker so you do not even have to wait to pull over to use it. Often, when a car has caught on fire, the only thing the driver and passengers can do is watch while their car is consumed by flames. Fires can cause serious damage, and having a fire extinguisher on hand can help you deter the expensive costs associated with this type of property damage.If you put the fire out before it reaches the gas tank, you can avoid potentially large explosions that will not only completely ruin your vehicle, it will likely also harm those around the accident. You can use it other locations. Having a fire extinguisher in your vehicle can also be useful if you spot flames in other locations outside of your vehicle. It can help with small fires on others property or even while you are camping or visiting a park. You never know when an emergency situation that involves fire will strike, so it is important to be prepared. You can use it to help those in need on the side of the road. If another person is involved in an accident while you are traveling, you can use your fire extinguisher to help them deal with the flames. This will not only help the person involved, but it will also aid emergency res-ponders who may need to deal with injury-related problems and may not have time to deal with a small car fire. It will provide peace of mind. Thankfully, newer cars do not have as much trouble with fires unless there is a very serious malfunction. Sometimes just knowing that you can take care of a fire should it occur is all you need. Fires can do serious damage and having a fire extinguisher can be a very comforting feeling. Fire extinguishers that work well for a car are generally smaller than ones that you would find in a home or business. The two-pound fire extinguisher is a good size for your vehicle, although some commercial vehicles are required to carry a larger size. Because your vehicle has the potential for many different types of fires—oil, electrical, gas, and an array of other potentially flammable substances—your car fire extinguisher needs to be able to handle several types of fires. Dry powder extinguishes tend to work best. They will also do the least amount of damage to the vehicle itself when you actually go to put out a fire, especially if it is in the engine. Simply getting a fire extinguisher is not the only thing that you must do. You should also be sure to service your fire extinguisher to ensure that it functions when you need it. 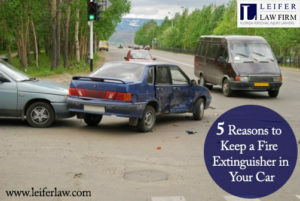 Because car fires often start due to faulty wiring or other mechanical issues, it is very possible that you have a personal liability case for any damages or injuries that a car fire may cause. You may also have a case if the car fire started for another reason. Work with a personal injury attorney to find out for sure. What if there is Property Damage after a Car Accident?